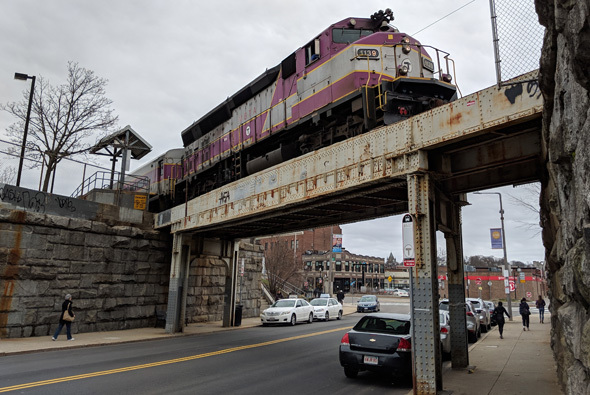 The MBTA plans to begin replacing the bridge that carries the Needham Line over Robert Street at the Roslindale Village train station early next year. Read more. 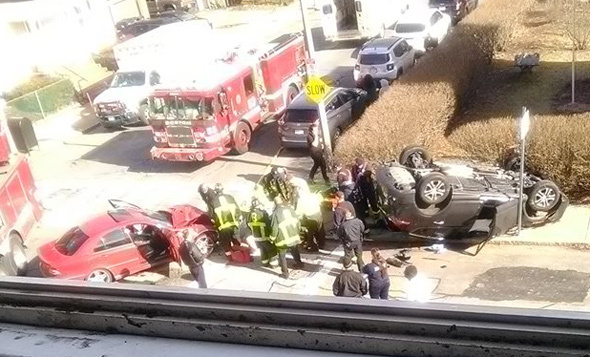 Sha'neka Love had a front-row seat for a crash at Brookfield Street at Robert Street shortly before 3 p.m. today, in which one car crashed into another, flipping it. Every single year, the city of Boston and the MBTA bicker over who should shovel the sidewalk in front of the Alexander the Great statue that sits by the base of the Roslindale Village train stop between Belgrade Avenue and Robert Street. Read more. The Robert Street family that normally outfits a dog statue outside their home in Sox or Pats jerseys seems to have decided that Halloween is coming early this year.